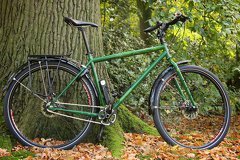 After running into some problems combining mudguards fenders with disc brakes I played it safe and got a rack that was explicitly marketed as being compatible with disc brakes. Originally I wanted the strongest rack I could find, so I could have the option of carrying a person on the back. In The Netherlands it is quite common to hitch a ride on the back of a bicycle. It turns out that even the strongest racks are rated to carry only up to 40 kilos. There are some very expensive special super strong and heavy racks, but they also require something more than a pair M5 bolts to take the load. 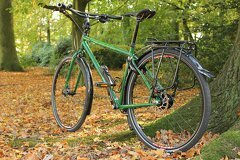 The selection of racks that are specifically made to be used with disc brakes is very limited. Some racks have a stud that goes straight up, but in my case that would also interfere with the disc brake. The Topeak Tourist DX rack provides a ridiculous amount of clearance from the disc brakes; on both sides. This makes the bicycle wider in the back. As long as the weight is equally distributed on each side it should not be a problem though. A nice bonus is that I could get this rack is considerably cheaper than some other popular brands like Tubus. Their claim to fame that their racks are made out of steel tubing, which is easier to fix in remote parts of the world. 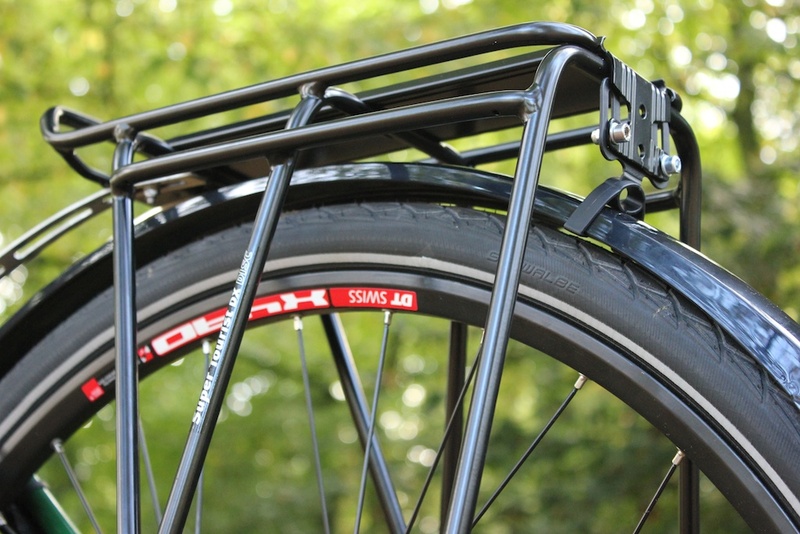 This Topeak rack is made out of aluminum tubing which should be stronger than solid aluminum (with similar mass). The rack can take up to 25 kilos, that seems a little low, but after carrying a laser printer that weighed a similar amount up some stairs I can tell you: it's a lot and I never intend to carry anything close to that weight on a cycling trip. 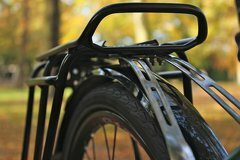 There is also a similar rack called the "Explorer", but it is less suited for panniers; it does not have the lower rails and the bent tube to keep them from touching the wheel. The rack uses Topeak's QuickTrack MTX-system where you can easily slide on some compatible Topeak bags or baskets. Personally I don't really care for that, but if you are interested you can check out the available options. Topeak sells also sells this rack with a spring. I did not get that one, I have used similar springs in the past and can tell you that they are excellent for crushing food and squeezing bags, but not for holding anything tight. Get some straps, bungee cords, rubber bands instead. Mounting the rack took some time. I installed two of these racks on two bicycles with different frame sizes. 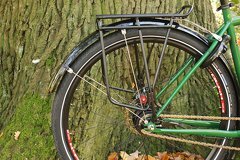 The rack comes with two metal strips that have been twisted 90 degrees to fit on the frame's rack mounts. However to make them fit you have to bend them in a curve yourself. There are 3 slits through which you need to put the bolts. It was difficult to judge which slit to use before bending the strips. It took me several attempts to get it right, and after the first one it turned out that for the smaller frame I had to use the other slit. 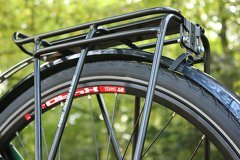 The rack is made to fit 26" and 28" wheels. It looks too big on the first, and is rather tight on the second. On the larger bicycle I have some wide mudguards and the the strips were so close that they were pushing against them. I was able to bend the strips there too, just enough to make everything fit. Now that they are on there I kind of like how low they are. The lower rack means that there is more space on top to carry for example a tent, and the lower center of gravity should make it a little bit more stable. 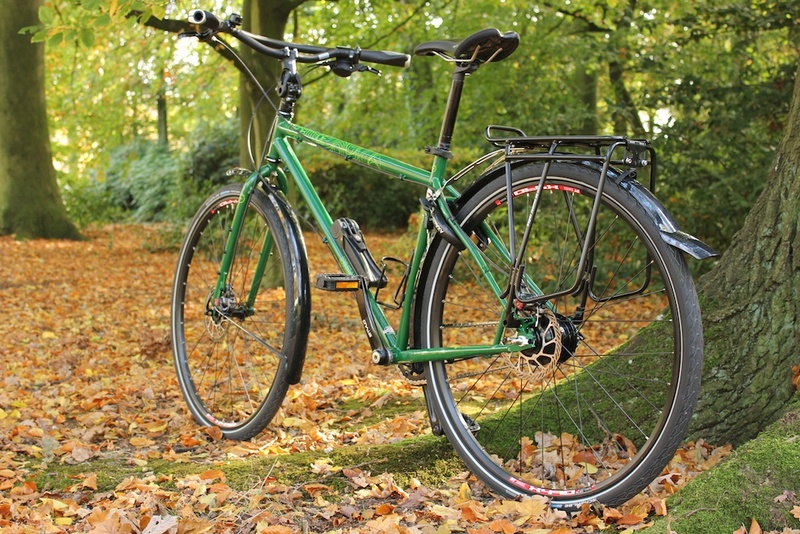 The downside of the lower rack is that panniers are also hanging lower which means less heel clearance, it has not been a problem for me, but it could be for people with large feet. The lower rails for hanging the panniers are a bit too close to the top in my opinion. It can be difficult to hook panniers on there, especially when there is other luggage on top. It would have been better if there was more space between them, like for example the Racktime racks have. On the rear of the rack there is a mount for a reflector or light. Without anything on there it looks like something is missing. It had two holes spaced 50 mm apart which will allow most lights to fit. Topeak also includes some plastic pieces that will help you mount their own lights on there. However these lights seem to be designed for a seat post and stick out when mounted on the rack. For my bicycles I got the Spanninga Lineo Xba rear light which I recommend highly. The bottom of the rack was not wide enough for my bicycle, I had to spread it a bit to make it fit, however this is understandable as it's better than having it be to wide. The disc brake version requires you to put in the bolts pretty deep. With a small hex key I had to use the long end on the bolt so could not apply enough torque to tighten the bolts enough, an hex key with a longer lever did the job. Some mudguards also come with a mount that can attach to this plate which is much more sturdy and pretty than having studs running from the middle of the wheel. I did this for my girlfriend's bicycle and it works great. After using the rack for more than two years it's still going strong. the caps pointing down on the end of the tubes have both disappeared on my bicycle, but are still there on my girlfriend's bicycle. Some of the bolts have started to rust a little after the bicycle was parked near the beach a few times. The rack itself has worn a bit from panniers rubbing, but is still fine. After replacing the bolts with longer ones and applying Loctite they have not come loose. The rubbing of the panniers was starting to wear down the aluminum. I have applied Sugru as an scratch protection layer. 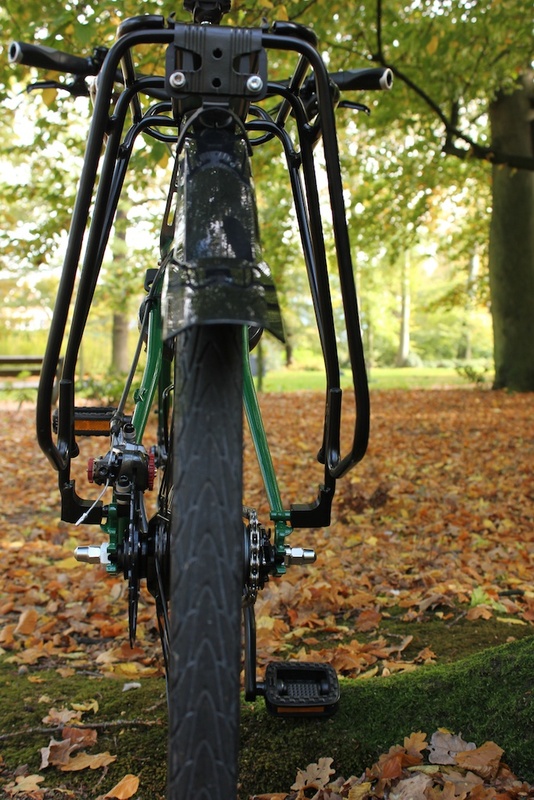 Rack on bicycle with 20.5" frame and SKS Bluemels mudguards. The SKS Bluemels are bigger than you usual mudguards, the stays from the rack (top right corner of the picture) had to be bent upward to fit. 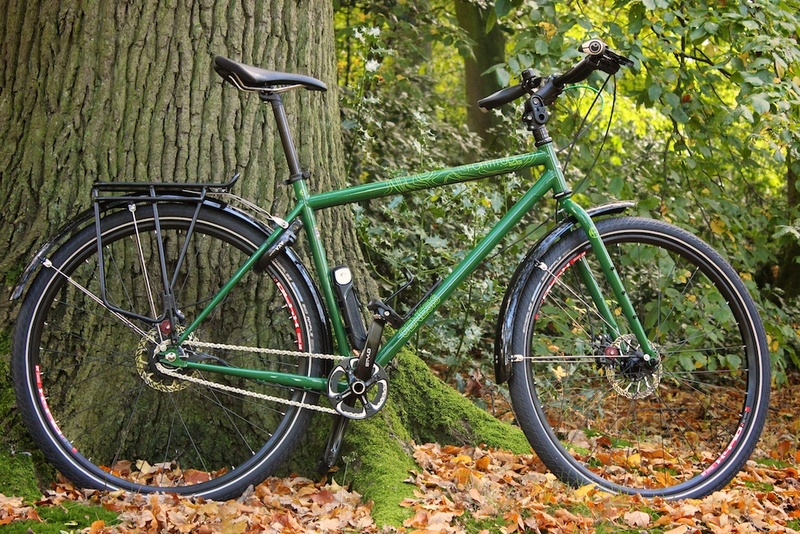 Rack on bicycle with 19" frame and Hebie Viper Stadtmeister mudguards. Hebie mudguards attached to rack's rear light mount. The metal strips with slits. 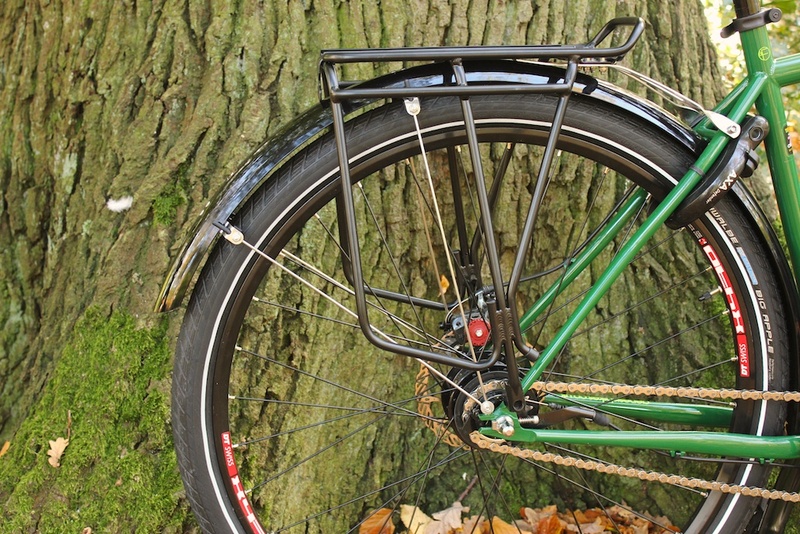 This rack has lots of clearance around the disc brakes!